Kryston are the inventors of the high strength specialist hooklength and since 1989 have single handedly led the way in hooklength design and technology. Throughout the entire carp world, anglers have broken more national and water records using a Kryston hooklength than on any other single brand of line. Every single Kryston hooklength is unique. We will only use the rare professional companies that excel in braiding to stringent surgical standards. We employ the very same machinery that produces the world's finest surgical sutures for our hooklengths. This legendary hooklength needs little introduction having already accounted for three World and many National and International records. 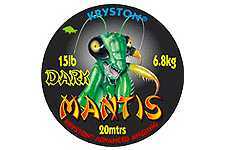 This new version fills the gap for those fishing over dark silty areas. Kryston have purposely avoided the mistake of giving this stunning product a solid black finish even though it's easier to do so, why? Because when you look carefully at the colour and composition of silt it is far from black.